June is a turning point for the United States internally and internationally. 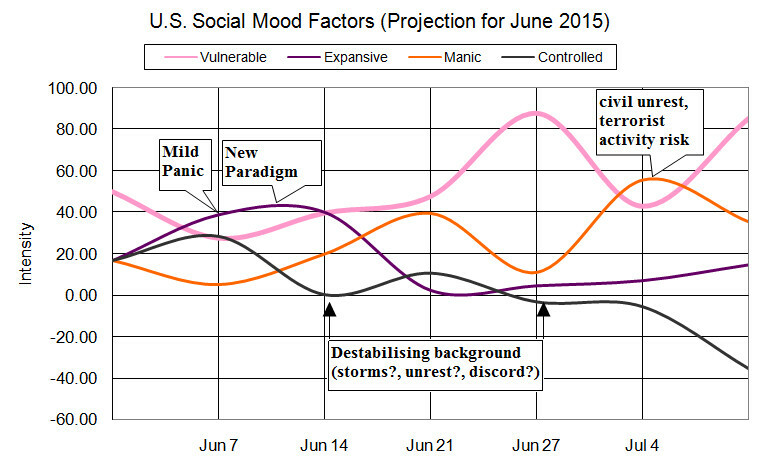 The chart below is the overall flow of social mood as projected for June 2015. Note to our followers: The addition of geographic analysis to our toolkit allows us greater precision than ever before in next-month future forecasting. Follow along with the news-flo this month and see how well we did translating social mood data into future headlines. 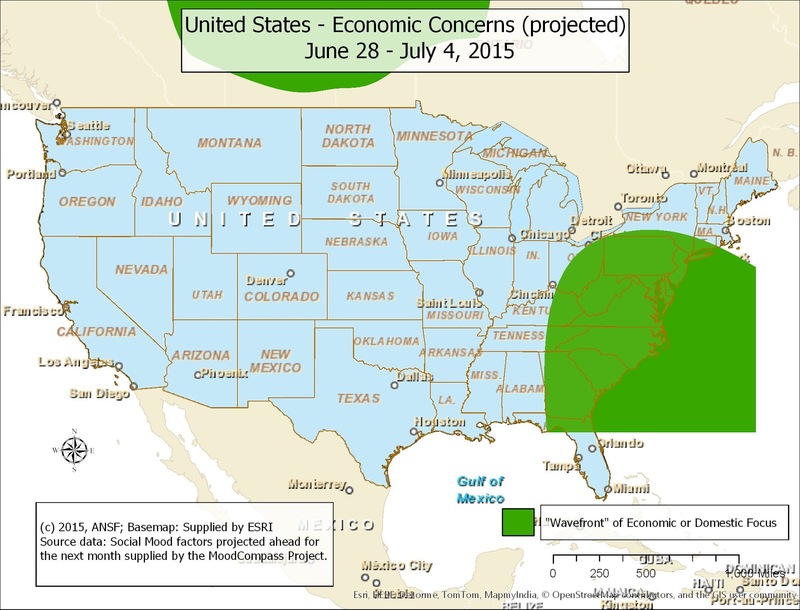 Week 1 (through June 6): Mild and ongoing economic concerns are present, but a major U.S. economic event is unlikely. Most of the stimulus for economic issues likely come from outside the U.S. (Greece?). Week 2 (through June 13): There may be residual economic concerns from any events of the first week of June, but they should dissipate during this period. Any stimulus for new economic concerns should primarily come from outside the U.S. Watch for a significant development in U.S. – China relations near June 11. 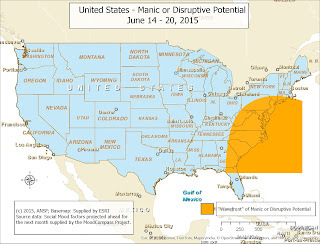 Week 3 (through June 20): There is a moderate risk of civil unrest or disruptive event(s) during this period (see map below). 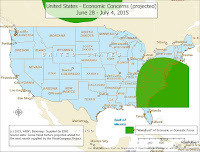 The region at highest risk is the Eastern States, but there is an elevated risk throughout the country. Manic mood may also show up financially as rising indicators of inflation. 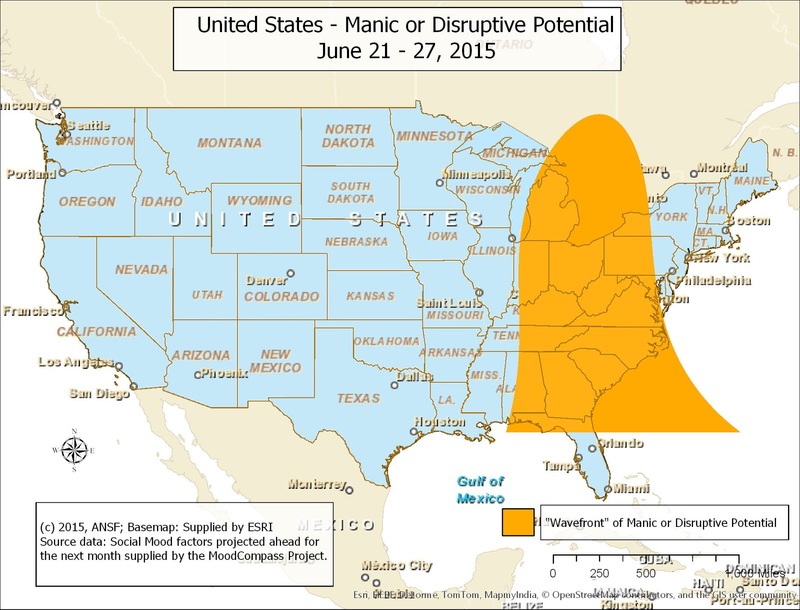 Week 4 (through June 27): The outlook of Americans should begin to take a more serious tone this week. 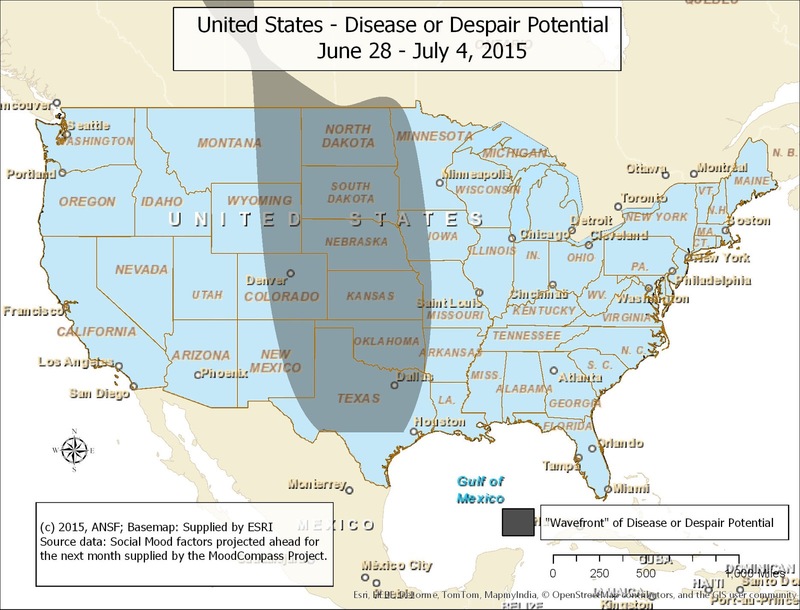 The region North of Texas has the highest projection of this mood factor during this period (see map below, left). However, this central location may also be indicative of a national shift. A new wave of economic concerns and domestic issues are starting to take hold in the U.S. 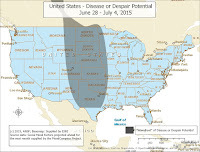 There is a moderate risk of civil unrest or disruptive event during this period, possibly expanding or continuing from last week (see map below, right). The region at highest risk is near Michigan and Ohio, but an elevated risk remains throughout the country. Manic mood may also show up financially as rising indicators of inflation. 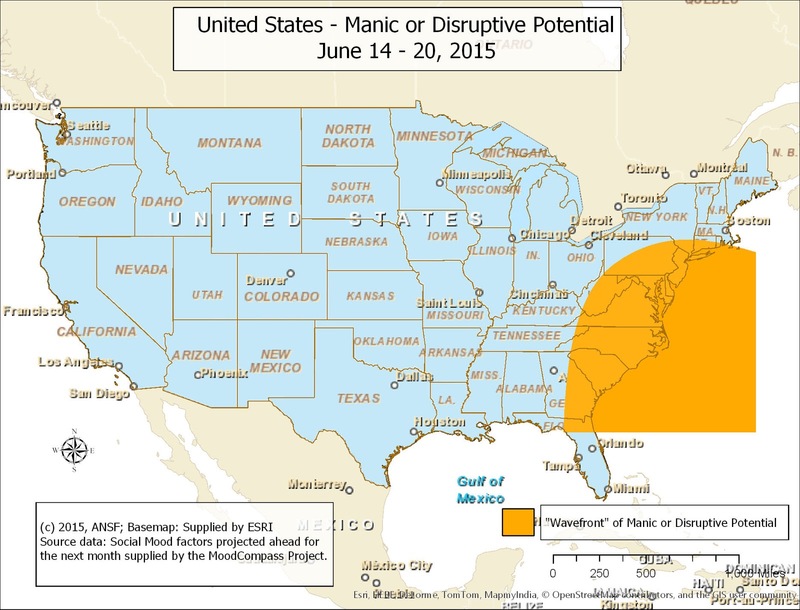 Week 5 (through July 4): The outlook of Americans should become much more serious in tone this week, expanding from last week (see map below, left). 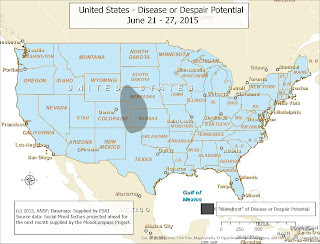 The "heartland" of America has the highest projection of this mood factor during this period. Economic concerns and domestic issues are growing and are likely a strong focus of politicians in Washington D.C. and traders on Wall Street as this mood factor is elevated in both D.C. and New York City (see map below, right). These issues are not necessarily limited to those areas.